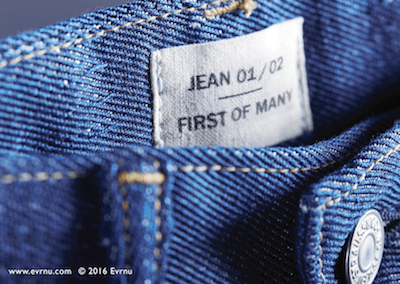 Textile technology startup Evrnu and Levi Strauss & Co. partnered this year to create the first pair of 511 jeans made from post-consumer cotton waste. This emerging alternative recycling technology is a "game-changer," says Evrnu founder Stacy Flynn. If it gains widespread adoption in the next several years, it could help meet the increasing need for textiles and reduce both waste and water consumption. According to the Council for Textile Recycling, the U.S. generates an average of 25 billion pounds of textiles per year, or 82 pounds per person. Eighty-five percent (21 billion pounds), or 70 pounds per person, ends up in our landfills -- accounting for 5 percent of all landfill space. And the apparel industry continues to grow. Flynn says it is predicted to double by 2025. Several brands now have buyback or recycling programs, designed to solicit used clothes for reuse or recycle. However, up until now there has been much more supply of used garments and textile fibers than demand for them. Partnerships like this one are crucial for closing the loop and making sure those donations go to good use. Flynn has a long career in the garment industry. In 2010, she visited China on a business trip, and as she traveled the country, she realized the damage that the apparel industry was doing to the environment both in China and globally. 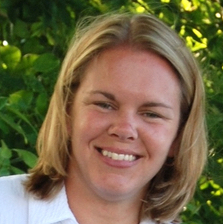 In her TEDx Talk, she describes how she set out to make a change. She went back to the beginning. Whether it's synthetic fiber or cotton fiber, both use a tremendous amount of natural resources to create. And there is so much waste. So she asked herself: "Is there a way to break this waste down and convert it into new fiber -- which is the linchpin of this entire system?" And she discovered that it was possible. "What we were not expecting is that we could create something so beautiful," Flynn told 3p. Evrnu takes cotton garment waste, purifies it and breaks it down into a pulp. (The process also works with synthetic waste, Flynn told 3p.) The organization then extrudes this pulp into a pristine new fiber that is finer than silk and stronger than cotton -- made entirely of garment waste, Flynn explained. The Natural Resources Defense Council estimates that each ton of fabric (used for jeans and T-shirts) consumes 200 tons of water. "This process uses 2 percent of the water used in the original cotton garment process," Flynn told 3p. This pilot pair of Levi’s 511 jeans was created from approximately five old cotton T-shirts. "We can take your old jeans, break them down to the molecular level, [and] build them back up into beautiful sweaters that feel good and hold color beautifully," Flynn told 3p. "When you are done with that sweater and it's been reused and recycled, we can break it down again and convert it back into premium jeans." Could this new recycling stream become as circular as glass, where it can be completely recycled an infinite number of times? It doesn't matter how worn the jeans, T-shirts or other garments are, Flynn said: If cellulose goes in, cellulose comes out. On the safe side, Evernu calculated 20 percent waste from the process, but it managed to save much more. Evrnu and Levi’s share the vision of eliminating waste and extending the life of cotton by repurposing used clothing when it’s no longer wearable. The partnership could help this technology scale up quickly and begin to make a significant impact. “Although [in the] early days, this technology holds great promise and is an exciting advancement as we explore the use of regenerated cotton to help significantly reduce our overall impact on the planet,” Paul Dillinger, head of global product innovation at Levi Strauss & Co., said in a press statement. Will this technology replace the cotton crop? No, Flynn told 3p. "The market will not move away from cotton; the major challenge from a macro perspective is: How do developed and emerging markets better manage available resources throughout the entire supply system? "As emerging markets expand, we've got to get smarter to meet that need; that's the biggest potential for regeneration of virgin materials. "The prediction is that apparel volume will double by 2025, and our current rate of resource extraction can not meet this demand; this is a massive opportunity for emerging technologies that efficiently manage resources. The key is balance." Right now, Evrnu is the only U.S. company in the game, although other companies are hot on its heels in the U.K., Finland and Sweden. Flynn said Evrnu is moving fast, looking to be commercialized within the next 10 years, be in retail by next year and make a dent in volume by 2020. "When I was born in the '70s, we pretty much threw everything away," Flynn said in her TED Talk. "Today we wouldn't even consider throwing paper, aluminum or glass away because it's fully recyclable. One day we'll be able to say the same thing about our clothing. One day very soon."